Living up to it's legendary name, the 2012 Cobra Jet Mustang has a tough bill to fill. But the 2012 Cobra Jet isn't likely to cause them any lost sleep. Introduced as the 40th anniversary Cobra Jet back in 2008. It did very well on a variety of racetracks. Drag racing setups regularly saw 8 second quarter miles. These Mustangs are for off-road use only and are legal for NHRA Stock Eliminator and several classes in the IHRA and NMRA. The biggest issue for most willing race enthusiasts who had the kind of coin you need to ante up for a seat in the big chair, was the very limited quantity of CJ's to go around. 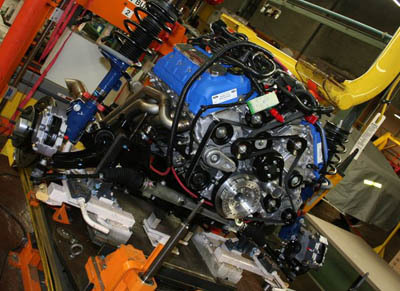 That still hasn't changed for the 2012 Cobra Jet pony car, with a grand total of only 50 factory turn key cars scheduled to be built at Ford's AAI assembly plant in Flat Rock, Michigan. The good news, however, is that there are two other options to owning your own fire breathing Mustang CJ. 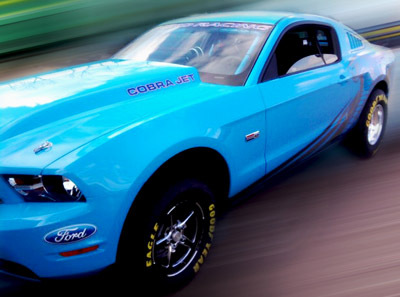 Option One is buying a factory direct Mustang competition roller car, based on the Ford Mustang Cobra Jet. It comes complete from the factory with all components except for the power train. 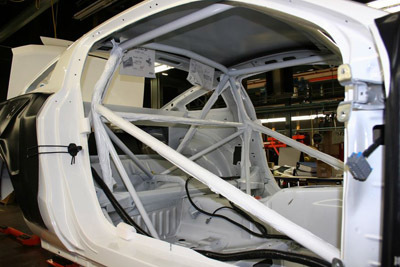 Option Two is using your own Ford Mustang donor car or a factory "body in white" (also in limited availability), and ordering all the required Cobrajet racing parts from the Ford Performance catalog and building your own. For a measly $1,995 you can get the optional Cobra Jet graphics package, which includes Powered-By-Ford fender emblems, Sweeping Snake side graphics, 5.4 liter Cobra Jet hood graphics, a Ford Racing windshield header decal, Ford oval front fascia decals, Ford oval license plate decal, and a FR500CJ deck lid decal. Ford says these graphics may be unique to each Cobra Jet body color. The 2012 Cobra Jet Mustang engine is a potent aluminum 5.4 liter supercharged engine, based on the 2011 Mustang SVT and is equipped with either a 4.0 liter Whipplecharger supercharger, or a 2.3 liter TVS blower. The base supercharger bumps up the horsepower to 430 hp in the new all aluminum 5.4 liter DOHC (dual overhead cam) engine. Specs for the optional larger supercharger are not known yet, but should be north of the 500 horsepower levels seen in the 2010 models, which were capable of propelling the previous year's cars to mid 8 second quarter mile times.